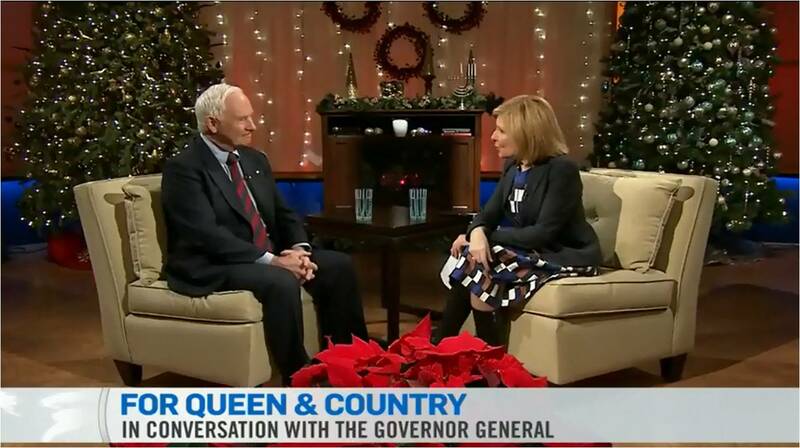 On 11 December 2012, Sandie Rinaldo interviewed Governor General David Johnston, who provided some good insights on the proper constitutional relationship between the Governor and Prime Minister under our system of Responsible Government. Governor General David Johnston affirmed that he represents Canada abroad only on and in accordance with the advice of the Prime Minister. Johnston also explained that he meets the Prime Minister “quite regularly,” which is “appropriate to the Office [of Governor General].” At this point, Sandie Rinaldo pressed him and asked the Governor General to divulge the contents of those confidential meetings. Johnston maintained the proper confidentiality of the vice-regal – prime ministerial relationship by refusing to divulge confidences and instead offered a broader description. Johnston explained that he and Prime Minister discuss “the parliamentary agenda”, which probably refers to the Speech from the Throne, scheduling Royal Assent where required, and to the bills that the Government intends to introduce. He and Prime Minister also cover “the affairs of the nation and often matters with a little more long-term approach.” He concluded that he finds the conversations helpful and hopes that the Prime Minister does as well. When Sandie Rinaldo pressed him again, Johnston made clear that “it would be inappropriate for [him] to go into specific details,” though he did disclose that their discussions pertain to “Canada’s global position,” which implies a strategic, long-term view, and that “some of the conversations relate to where we see Canada in the globe today and what the aspirations are, looking a few years out, and what are some of the policies that contribute to that.” Johnston then artfully pivoted the interview back to his original statement and elaborated on his “working visits abroad,” which “fit into a foreign affairs strategy.” In this case, he noted that the Harper government has emphasized Latin America in its foreign and trade policies since 2007. Overall, the constitutional relationship between Governor General Johnston and Prime Minister Harper seems to adhere to the principles of Responsible Government. The Governor exercises his three rights under Walter Bagehot’s ideal-type : “to be consulted, to advise, and to warn.” This formula reinforces Responsible Government, the system under which “Ministers of the Crown take responsibility for all acts of the Crown,” as Sir John George Bourinot described it. The Canadian procedures on these meetings between the Prime Minister and Governor General mirror the weekly meeting between the British Prime Minister and the Queen of the United Kingdom. They normally meet for 60 to 90 minutes each week when the Queen is in London, and the Queen generally invites the Prime Minister to her personal summer retreat in Balmoral, Scotland for a few days every August. Various former British Prime Ministers — particularly John Major and Tony Blair — have enthusiastically described these weekly meetings as highly productive and helpful because of the Queen’s 60 years of institutional memory. They always take care to preserve the absolute confidence with the Sovereign that they and all Prime Ministers have enjoyed, and emphasize this point strongly in media interviews. It’s simply two people sitting down talking in an entirely relaxed and informal way. But [the consultations] cover everything. The Queen, as head of state, has a right to know what is happening and has a right to know what her Prime Minister has in mind to do. I certainly found that I could discuss anything with her, in total confidence, and that included, by the way, all sorts of cabinet ruptures and difficulties. Well, we don’t talk about [the weekly audience], but it would last about one hour, and one would tell her about the things which had gone on and the things which were going to come up. We would probably both have seen some overseas visitors – heads of state and heads of government – and just [engaged in] a general discussion of anything that was right at the forefront of people’s minds at a given moment. So it was what was going to come up, what was being dealt with, and how it was being dealt with. The Queen and her Prime Minister probably discuss Cabinet business, the parliamentary calendar, and upcoming foreign travel, in addition to any of the specifics that these three former Prime Ministers cited. Ultimately, the Sovereign or Governor must act on and in accordance with the advice of the Prime Minister, save for those exceptional circumstances where the he would be prepared to reject or act contrary to ministerial advice and thus dismiss the Prime Minister and Ministry from office. However, the Sovereign or Governor may persuade the Prime Minister, through wise counsel, to shift course or reconsider a policy, which could preclude the use of a constitutional instruments as blunt as the reserve powers. In practice, [the consultation] will vary in extent, depth, or frequency according to the nature of the personal relationship between the Prime Minister and Governor General. I would welcome any formal institutionalization of this constitutional relationship in Canada, because the Sovereign or Governor can best exercise the “Bagehot’s Rights” during this discussions. Good Governors General like Johnston may indeed have a lot to offer to any Prime Minister who wants to hear such advice. That said, no Governor General in any Realm would ever match the depth and breadth of knowledge and experience of Her Majesty Queen Elizabeth II. Governor General David Johnston, interview with Sandie Rinaldo, “For Queen & Country: In Conversation with the Governor General,” CTV News, 11 December 2012. [accessed 27 December 2012]. John Major, interview with Andrew Marr in The Diamond Queen, 6 February 2012; Margaret Thatcher, interview by Brian Lamb, CSPAN, 9 March 1991. Robert Macgregor Dawson. “The Constitutional Question.” Dalhousie Review VI, no. 3 (October 1926): 332-337. Canada. Privy Council Office, Manual of Official Procedure of the Government of Canada, Henry F. Davis and André Millar. (Ottawa, Government of Canada, 1968): 151. This entry was posted in Consultations, Crown (Powers and Office), Responsible Government and tagged David Johnston, Manual of Official Procedure of the Government of Canada, Robert Macgregor Dawson, Sandie Rinaldo, Sir John George Bourinot, Stephen Harper, Walter Bagehot. Bookmark the permalink.